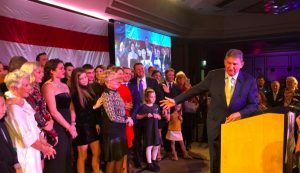 U.S. Sen. Joe Manchin, D-W.Va. celebrates with his family moments after being declared the unofficial winner in his race to keep his senate seat. CHARLESTON, W.Va. — Standing with his wife Gayle and children behind him, U.S. Sen. Joe Manchin, D-W.Va., celebrated arguably the biggest win of his more than 30 years in West Virginia politics: Beating Republican challenger and state Attorney General Patrick Morrisey. Manchin won about 50 percent of the vote to Morrisey’s 46 percent, with Libertarian Rusty Hollen taking about 4 percent. “Nobody in the United States has ever won in a state where the president in the previous election won by 42 points,” Manchin said, referring to President Donald Trump, who visited the state three times in recent months to rally for Morrisey.